The Kenyan Ministry of Tourism announced Thursday that eight black rhinoceroses had died following a botched attempt to start a new population of the critically endangered species. The eight animals likely died of salt poisoning, a release says. The rhinos were unaccustomed to the level of salt in water in their new environment and could not adapt. In salt poisoning, high salt levels in the water lead animals to become dehydrated. They then began to drink more salty water – a cycle that can eventually kill them. "This is a major conservation tragedy, not just for Kenya but for all rhinos. It’s surprising because Kenya (KWS) has conducted many successful large scale translocations of rhinos before," Paula Kahumbu, CEO of Wildlife Direct, a conservation group with a focus on Africa's critically endangered species, wrote on Facebook. "I dread to think of the suffering that these poor animals endured before they died. We need to know what went wrong so that it never happens again." The eight rhinos were among 11 that had been moved between national parks in Kenya — a process known as translocation. In their new home at Tsavo East National Park, they were meant to start a rhino population in a newly created sanctuary. Translocation is a common conservation tactic, The Washington Post reports. The practice allows endangered species to start new populations in remote areas where they will be insulated from danger and are more likely to thrive. It's a process Kahumbu likened to moving gold bullion — it's difficult, expensive, risky and requires careful planning. The Ministry of Tourism's says the three remaining rhinos at the sanctuary are being provided with fresh water as authorities investigate the incident. Originally, a total of 14 rhinos were to be moved to the sanctuary. Those plans are now on hold, as are all black rhinoceros translocations, the release says. There less than 5,400 of the species alive, according to the World Wildlife Fund. It reports that the deadliest threat to the species is poaching — rhino horns are a lucrative and illegal trade. Overall, translocating rhinos has been a successful effort, the Ministry of Tourism said. It said that between 2005 and 2017 nearly 150 rhinos had been translocated with only eight deaths, excluding the most recent incident. 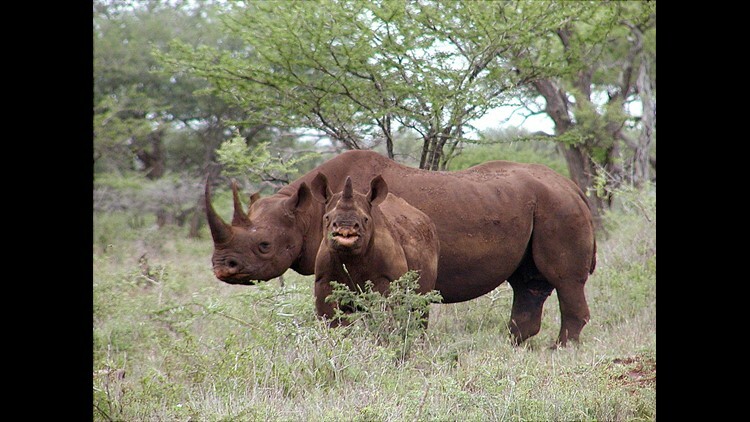 A black rhino male and calf in Mkuze, South Africa.